The wine industry is one of the most fascinating ones. Romania has an important heritage in this field. The country is filled with important vineyards and cellars that may successfully compete with the ones from France, Italy and many others. One of the most popular cellars from Romania is Budureasca Cellar. Budureasca vineyards are part of the famous Dealu Mare region (located in the Southern Subcarpathians) and spread over an area of approximately 275 hectares. The altitude of Budureasca vineyards ranges from 175m to 400m. The conditions favor the production of black grapes, but white grapes also enjoy extremely favorable conditions, resulting in very aromatic and fruity white wines. In this article we will present you some interesting facts about Budureasca Cellar, but from an “uncommon” perspective. Probably, it’s the first interview about...naming strategy, interesting naming facts and naming vision done with a Romanian wine producer. For making this happen, we’ve had a discussion with Olga Miloiu, Executive Director at Budureasca. Namzya: It’s a known fact that the wine cellars names are often connected with the geographic area from they are belonging. Budureasca is an example for this “unwritten” rule. What is the name history? What does it mean? How was it found? Olga Miloiu: Budureasca is the name of a small river (Budureasca Valley) and it’s also the name of an archaeological site which was discovered near the place where our vineyard and cellar are located. This site has contained many artefacts (amphoras and different tools) proving that the old Dacian people used to rise vines and produce wines, two thousand years ago. Therefore, we decided to take this as our name, and to continue nowadays an old tradition, begun two thousand years before. Namzya: Another “unwritten” rule in wine naming says that most wines get their names in two different ways: they are named for their grape variety (the grape that was used to make the wine) or they are named for the region of the world in which the wine was made. What do you think about this rule? Do you take it into consideration when you have to name a new wine product? Olga Miloiu: We did not take these two rules such as. It’s true, the grapes variety is written on the front label generally, but it is not actually the range name. It is just a way to identify the products within a range. Usually the range has its own name. Using the region name is also a practice, especially when the region is very well known for good wines production. But we have chosen to find our names following the Dacian’s people history and we’ve been inspired about the personalities of those times. Namzya: We have noticed that you have 8 product range that are defining your wine portfolio: Origini, Organic, Noble 5, The Vine in Flames, Budureasca Premium, Bristena, Budureasca Standard, Exuberant. Could you briefly give us some information about what does each of these names mean? Olga Miloiu: Budureasca is the name of our main ranges, and it was declined in two directions: Budureasca Standard range (mainly medium dry wines, which are not aged in barrels) and Budureasca Premium range (dry wines, aged in barrels totally or partially). Each wine inside a range has its own name - usually the grapes variety name, but there are also blends, which had been named differently. We have blends such Fume (name inspired from the production process, which includes aging in toasted barrels) or Daphix and Zenovius – who were important people of those old historical times (the entire legends being described on the back labels). Our super-premium range was called Origini, following the same idea of our ancient beginnings, as wine producing people. Here we have wines called by the grapes variety name, but also blends such as Oro Manisa, which means “golden divine language”, in old dacian language. Another range was named Bristena – who was Decebal’s daughter (Decebal was one of the bravest Dacian people leaders, and he had two daughters – Bristena and Andrada), this range being designed especially for women, but not only (aromatic sweet wines). Of course, we have ranges named in international style, such as Vine in Flames, in order to be easily understood by our foreign customers, but also this name is inspired from the old dacian legend saying that Decebal burned all vineyards, following the wise Deceneu priest’s advice, in order the grapes and wines not to be an attraction for the enemies. Noble is another range, exclusively of blends, and this name follows the same idea of history and legend. It is the story of a royal family in which every variety is a family member. Obviously, the Cabernet Sauvignon is the great king. Of course, our bio wines range was named Budureasca Organic, while Exuberant is a range designed to parties and special events. Namzya: How does the name of a wine or of a product range influence the consumers perception about a certain product? Olga Miloiu: The name has to transmit something. It has to produce an effect in customer’s mind. It is important to have a story behind so that it can be understood. The name must be somehow unforgettable. Many times the name is decisive for the product positioning on the market. When the name is consistent and has a strong meaning, as content, not only as a shape of word, than the product (the wine) becomes interesting for the customer, before being tasted. It is precepted as a potential, treasured and appreciated wine, and when the quality confirms the first good impression, the success is almost got. The name must remain in the customer’s memory, in association with a good quality, and then he will revert to that product. Namzya: From what we have noticed in the wine industry, marketers tend to be conservatory regarding this naming project. Naming innovation is not an option in many cases. What is your opinion regarding this subject? Should wine producers have more courageous and innovative naming decisions? Olga Miloiu: Yes, I am sure this issue is fundamental for the product’s success. Researching and creation take time, and this are activities to be done by specialized people. But it’s a fact that the collaboration with the producers must be very tide, because the producer knows its history, its values, its assets and advantages, all the things that could became valuable through a name well inspired and well chosen. All these information must be transmitted to those who take the responsibility of processing them in order to find or to build the best names. 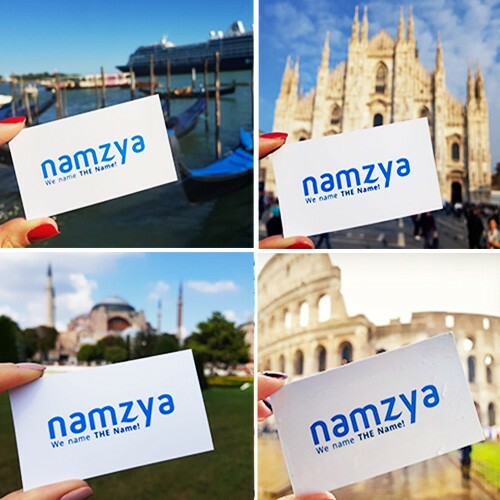 Namzya: What does inspire you most when you are trying to find a suitable brand name for one of your products? Olga Miloiu: The market segment that we address to is very important. This is the starting point. The name is the first message to the targeted customers and it must be adapted and specially created for them. Of course, the new name must keep the “Budureasca family” naming style, in order to be easily recognized as part of our portfolio. If the production process is a special one, making the difference, then we can use this advantage when we build the name. There are many variables to consider during the naming process, so it is impossible to count all of them in a list. It is a matter of context, market segment and product’s specific. Namzya: When should we expect a new wine launching in your portfolio? Olga Miloiu: This year, quite soon! We are already working to launch two new products in the next period of time. One is linked with the centenarian year, celebrating the Great Union, and we are close to release it in the market – probably in July. And the second one is a surprise – all I can say is that it’s strong linked with our history and it’s inspired from one of our most well-known old legends. Learn as much as you can about the history of the wine and the history of the places where the vineyards are located. Take time for making a strong naming research and be brave to take into consideration innovative naming ideas too. Be original, but keep it in mind that an homogeneous naming structure is important for your customers.